Forrás: Okay Africa. Szerző: Alyssa Klein. 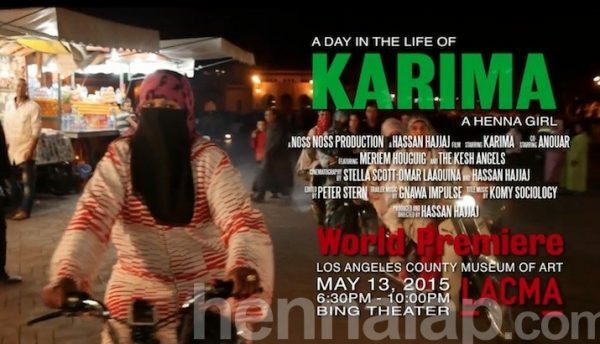 “AFTER 2 YEARS OF WORKING ON MY NEW DOCUMENTARY ‘A DAY IN THE LIFE OF KARIMA A HENNA GIRL’ IT WILL BE SHOW AT LACMA MUSEUM ON 13TH MAY,ITS FREE ENTRANCE. A Day In The Life Of Karima: A Henna Girl will make its world premiere May 13th at the Los Angeles County Museum of Art’s Bing Theater. Watch the film’s trailer and the music video for “Karima” below. For more from Hajjaj, see his Moroccan biker barbie doll photos and his Wax Super Deluxe menswear collection with Moroccan designer Amine Bendriouich.